The cube has become the trending shape in the technology world. From mp3 players to speakers and now to pico projectors, its versatility has inspired some interesting gadgets. My current brush with cubism is with Innoio's Smart Beam Innocube. 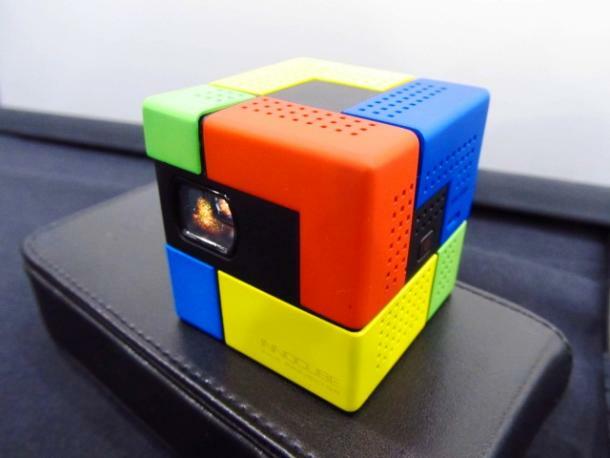 At 1.8 x 1.8 x 2.0 inches in size, this pico projector is smaller than a Rubik's cube and is much less perplexing. It has been hailed as a story time projector for kids, but don't let this description fool you. The Innocube puts the fun back into functional. The Smart Beam pico projector is low maintenance and portable. Packaged with the projector are an AC adapter, HDMI cable, and an MHL cable. Each end of the cables is clearly marked as to where they connect. I am not a fan of cables, and I appreciate Innoio's step to eliminate the guesswork for me. When using an iDevice, such as an iPhone, iPad, or iPod, you will need to use the Apple Digital AV adapter or Lightning Digital AV adapter (sold separately) with the provided HDMI cable. This projector also comes wrapped in its own plastic shock absorber. Mine had a clear case; however, I have seen it with a multi-colored sleeve that resembles a block of Legos.